Healthy Breakfast is the Most Important Meal of the Day. Really? Healthy Breakfast is the Most Important Meal of the Day! Really? From the beginning of humanity to the start of the industrial revolution, people didn’t have such a thing as a healthy breakfast. Moreover, their most important meal of the day was likely to be the one meal when they had the most food to eat. Meanwhile, all that changed during the industrial revolution. Indeed, when people ate before leaving home for a long day of work, breakfast started to become the most important meal of the day. So today, the basic question is, does eating a healthy breakfast really matters? One can say that since breakfast is a byproduct of the industrial revolution, conditions today are significantly different when compared to conditions in the industrial revolution. Moreover, as described before, people have lived without breakfast for many thousands of years. Therefore, eating breakfast is not really required. However, according to a Mintel survey, 51 percent of U.S. adults believe that breakfast is more essential than either lunch or dinner. Indeed, 92 percent of U.S. adults eat breakfast during the week, while 95 percent eat breakfast on the weekends. On the other hand, a 2011 NPD survey reported that one in ten or 31 million people skipped breakfast. And the survey, further reported, that 28 percent of males, 18 percent of females aged 18 to 34, 18 percent of males, 13 percent of females aged 35 to 54, and 11 percent of males, 10 percent of females aged 55 and over skipped breakfast. Meanwhile, research shows that breakfast is not necessary for you to have healthy weight. 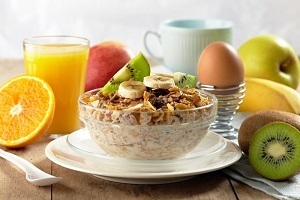 Consequently, whether breakfast helps you lose weight or not, is up to the individual. Those people having breakfast ingest a portion of their daily calories in the morning. But, eating breakfast doesn’t guarantee they’ll eat less the rest of the day. In fact, they may eat far more calories than budgeted for the remaining meals of the day. While those who skip breakfast, don’t necessarily eat less calories either. On the contrary, they could eat more calories during the day to exceed what they would have eaten had they had a breakfast in the first place. Moreover, studies also report that skipping breakfast doesn’t affect the total number of calories burned in a day. Above all, the Academy of Nutrition and Dietetics recommend that you eat four or five small meals a day to stop feeling hungry. And one of these is breakfast. In fact, eating just a modest breakfast means you won’t get hungry later in the morning. On the other hand, skipping breakfast on days when you are working, may tempt you to drop by a fast food place or walk to a vending machine down the hall, and eat foods with lots of sugar, unhealthy fats and calories. Incidentally a recent study found that metabolic rates of those who had breakfast and those who didn’t was about the same. Meanwhile, another recent study reported no significant difference in weight loss between those who ate breakfast and those who didn’t. Above all, eating a healthy breakfast is a way to get vitamins, lean proteins, healthy fats, and fiber from foods like dairy, fruits, and whole grains that help you feel full. Indeed you feel full longer because the proteins and fiber take longer to digest. Furthermore fiber, particularly soluble fiber slows the absorption of sugar and helps improve blood sugar levels so that you won’t get cravings for sugar. Most noteworthy, breakfast needs two things: carbohydrates and proteins. While proteins keep you feeling full until the next meal, carbohydrates provide energy for the body and brain. Examples of carbohydrates include, whole grain cereals, bread, fresh fruits, or veggies. And examples of proteins include cottage cheese, yogurt, low-fat milk, nuts, or legumes. Moreover, adults need 20-30 grams of proteins in the morning, which you can get from 6 to 8 ounces of Greek Yogurt, two spoons of flaxseed, or an egg. Eggs provide lots of nutrition and high-quality proteins. Most of all, research shows that the dietary cholesterol in eggs has minimal effect on your body’s bad cholesterol. If you can’t eat eggs, eat nuts because nuts are an excellent source of proteins. Nuts also contain antioxidants, magnesium, potassium, and healthy fats. Cottage cheese also has lots of proteins. Indeed, a study showed that cottage cheese also curbs hunger. And cottage cheese is rich in vitamins B, A and calcium. The thick and creamy Greek yogurt has lots of proteins, calcium and probiotics to help you get and maintain a healthy gut. Oatmeal contains beta glucan – a thick sticky fiber that help you feel full longer. As a result you may eat less for lunch. Moreover, oats are rich in antioxidants, omega-3 fatty acids, potassium and folate. Most of all, eat steel-cut oats, because they have more protein and fiber as well as a low glycemic index which means your blood sugar won’t increase so much. ​Flaxseed is rich in omega-3 fatty acids, proteins, and fiber. Flaxseed help lower blood levels of cholesterol, prove insulin sensitivity, lower blood sugar. Just sprinkle flaxseed with oats. Coffee has antioxidants and helps fight inflammation. And a review by the American Diabetes Association reported that coffee could decrease risk of developing Type 2 diabetes. A 2013 survey by the NPD reported the top ten items American have for breakfast at home or away from home. Moreover, when eating out, breakfast sandwiches outrank even coffee. Indeed, people want healthy foods for breakfast. First and foremost, ingesting nutrient dense high-fiber breakfast in the morning means you are less likely to get hungry throughout the day while you lose weight. Next, eating carbohydrates helps your brain by improving memory and concentration levels as well as your mood while lowering stress levels. Also, a 10 year study showed people who regularly ate breakfast decreased their risk of type 2 diabetes by almost 30 percent. Still, this may be because skipping breakfast increases insulin resistance which is common with Type 2 diabetes. Regrettably, previous studies reported eating breakfast was important for losing weight. However, an American Journal of Clinical Nutrition study reported that weight was not affected by eating or skipping breakfast. In addition, researchers in Australia recently reviewed 13 different studies ranging from 24 hour studies to 16 week studies. And the researchers reported that eating or skipping breakfast had hardly any impact on weight. Meanwhile, research shows eating a healthy breakfast allowed people who lost weight to keep it off. Most of all if you eat breakfast to lose weight, then you have to not overeat and eat too any calories in the breakfast. And if you skip breakfast to lose weight, you have to not overeat at lunch and/or dinner. In the end it doesn’t matter if you eat breakfast or not. If you want to maintain or lose weight you have to monitor all your meals throughout the day. Skipping a healthy breakfast, regularly, effects your body in the following ways. First of all, the circadian cycle causes stress cortisol hormone levels to rise 50 percent in healthy people about 20 to 30 minutes after waking up. Next, levels of your hunger hormone ghrelin are lowest around nine in the morning. Indeed you are least hungry when you wake up. After you wake up, ghrelin levels increase between 9 AM to noon. In addition, blood sugar or blood glucose levels are low when you wake up. And these are needed by your brain and muscles. Therefore you may not have enough energy to do your morning chores. And, when glucose levels are low you become irritable and tired. Therefore, eating breakfast raises your blood sugar levels while lowering levels of cortisol. Finally, when you skip breakfast, your body thinks that food is going to be hard to come by and that is should conserve energy. Consequently, the metabolic rate slows, which causes the body to start storing fat. As a result, your body will store excess eaten calories as fat. Furthermore, studies have found that although people who skip breakfast eat slightly fewer calories during the day, they tend to have a higher BMI. On the other hand, eating breakfast causes your metabolic rate to rise which, in turn, results in more calories being burned throughout the day. On the other hand, skipping or postponing breakfast, causes your stress cortisol levels to continue rising, your blood sugar levels continue to fall and your ghrelin levels rise with the morning. All of these, together makes you feel hungry, anxious, and irritable as the morning hours tick by. The 2017 Journal Circulation had plenty of data showing link between skipping breakfast and becoming overweight. Regularly skipping a healthy breakfast effects your general health in the following ways. First of all, your diastolic blood pressure and your systolic blood pressure both go up. Next, blood concentrations of insulin, triglycerides, free fatty acids and LDL-cholesterol increase. Also, blood concentrations of HDL-cholesterol fall. The 2017 Journal of the American College of Cardiology reported that people who skip breakfast and more likely to get atherosclerosis. Indeed, atherosclerosis is the narrowing and hardening of arteries caused by the buildup of plaque. Regrettably, atherosclerosis leads to heart attack and stroke. These people also have higher cholesterol levels, higher blood pressure, overweight and bigger waistlines. And, according to the American Heart Association, skipping breakfast, Increases the risk of atherosclerosis, heart disease, high blood pressure, diabetes, obesity and high cholesterol. Regrettably, if you are not already eating breakfast, the science is not strong enough to recommend you do. Furthermore, a 16 year Harvard study of 27,000 male healthcare workers between the ages of 45 to 82, found that men skipping breakfast were 27 percent more likely to experience heart attacks or die from a coronary heart disease. And if you exercise in the morning or early afternoon, breakfast provides the fuel needed to workout hard and burn more calories. On the other hand, exercising without breakfast, means that your depleted sugar levels won’t give you the energy needed for a hard workout. In addition, levels of insulin and liver glycogen are lowest when you wake up. Furthermore, according to the Journal of Frontiers of Human Neuroscience, breakfast restores glycogen in the liver and stabilizes insulin levels. And, if you don’t replenish these glucose levels in the morning, you will feel tired, cranky and hungry. Regrettably, going through the workouts will be a struggle for you. However, if you can overcome the lack of energy and exercise, your body will use the glycogen stored in the muscles to get energy. And when glycogen, in the muscles gets too low, your body turns to burning fatty acids, which helps you lose body fat. Next, the healthy breakfast gives your brain and body energy needed to start your day and helps you get through the morning. Lastly, if you exercise later in the morning or early afternoon, the healthy breakfast gives you to energy for your most demanding workouts.